Sweet 600 square foot cabin for up to three guests. Just 8 miles West of West Yellowstone & the Yellowstone National Park entrance. Stunning views of Lionhead Mountain and surrounding peaks. Easy access to forest service trails, to Hebgen Lake and to fishing on area rivers. Satellite TV and wireless Internet access. Brief Description: Wooded Bliss Two is a great base camp for exploring the Yellowstone area and what an awesome alternative to a hotel room! It's just 8 miles to the park entrance and is nestled in an aspen grove (offering stunning colors to fall visitors!) You're surrounded by national forest trails for hiking, mountain biking, and snowmobiling and it's just a short drive to a quiet cove on Hebgen Lake. For larger groups the other half of the duplex, Wooded Bliss One, can also be rented. Bedrooms and baths: The cabin has one bedroom and one bath. The comfortable bedroom has a queen size bed. There is additional sleeping space on a fold out futon couch in the living room. There is a full bath with a stall shower. Kitchen: The bright kitchen has a gas range and oven, microwave, blender, electric griddle, and crock pot as well as a good selection of picnic and serving ware. Dining area: There is counter dining for three as well as a picnic table in the yard. Living room: The cozy living room has a 32' flat screen 3D HD TV with satellite service, VCR and DVD player, family movies and a great selection of games and books for guests to enjoy. The couch folds out for additional sleeping space. Setting, acreage, and views: Wooded Bliss is in a woodsy vacation home neighborhood about 8 miles West of West Yellowstone, which is the West entrance to Yellowstone National Park. It sits on one half acre and enjoys incredible views of Lionhead Mountain and other peaks along the Continental Divide. You're likely to see elk, moose and maybe even a bear in this beautiful wild area! 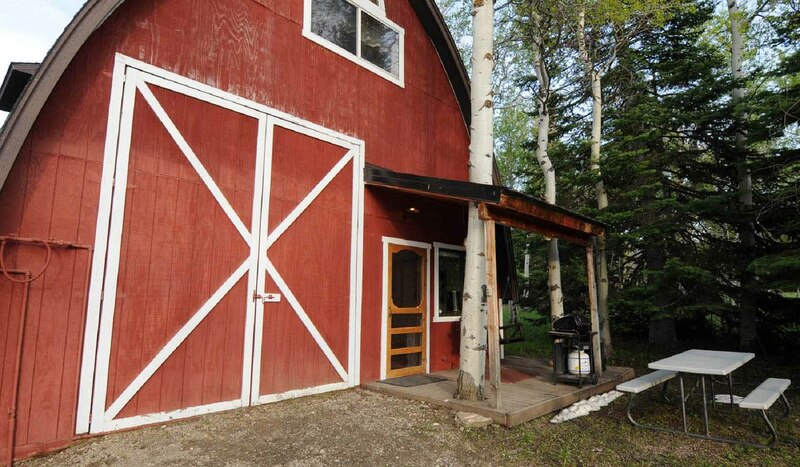 Outdoor Amenities: Wooded Bliss Two has a West facing front porch with a porch swing for enjoying sunsets over the Continental Divide. There's also a gas barbecue grill and a picnic table for your outdoor meals. Activities nearby: In winter you can snowmobile right from Wooded Bliss and get onto hundreds of miles of groomed snowmobile trails. If you prefer Nordic skiing, West Yellowstone's Rendezvous Trails are a short drive away and you can explore Yellowstone Park by snowcoach. For an especially memorable summer experience in the park, book a specialized private tour with our sister company, Greater Yellowstone Guides.In summer there's hiking and mountain biking right out the door, fishing on blue ribbon streams, boating on Hebgen Lake and of course day trips into Yellowstone Park. There's so much to do! Closest town and airport: You are 8 miles from the town of West Yellowstone, 90 miles from Bozeman's Gallatin Field Airport and 110 miles from Idaho Falls, Idaho.